This classic cake has a deep chocolate flavor and close grained, velvety crumb. A great keeper, it’s nice to have on hand in the freezer for that unexpected occasion. The cake can be dressed up with a little Dark Chocolate Ganache (page 412) spooned over the top and allowed to drip alluringly down the sides. Be sure to let the ganache cool to between 85° and 90°F before spooning it over the cake—at that temperature, it is cool enough to run in thick rivulets for a beautiful finish. 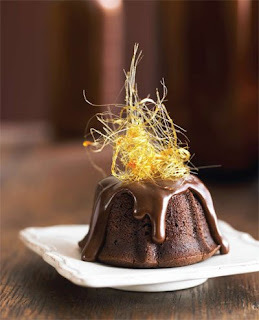 For a stunning finish to a special occasion, bake the cake in individual or min bundt pans, glaze with chocolate ganache, then add a tophat of Spun Sugar (page 433). 1 Preheat the oven to 350°F and position an oven rack in the center. Lightly coat the pan with melted butter, oil, or high-heat canola-oil spray, and fit it with parchment paper to extend up both long sides to the top of the pan. The cake can be made several days ahead and kept at room temperature, wrapped in plastic wrap. Or double-wrap it, put in a resealable plastic freezer bag, and freeze for up to 8 weeks. Use an individual Bundt cake pan (with six 1-cup molds) and follow the instructions for the Individual Bundt Cakes variation (page 312), but bake for 16 to 19 minutes. See recipe introduction for finishing ideas. Makes 6 individual Bundt cakes. Use a mini Bundt pan (with twelve ¼-cup molds) and follow the instructions for the Mini Bundt Cakes variation (page 312), baking for 13 to 15 minutes. See recipe introduction for finishing ideas. Makes about 18 mini Bundt cakes. The addition of espresso here is not just an enticement for caffeine addicts. Full-bodied, bitter espresso is often paired with dark chocolate because it deepens and enhances the flavor, making it taste even more, well, chocolaty. You won’t notice the coffee flavor, but if you leave it out, the cake will have a lighter chocolate profile. If you wish to omit the espresso, try adding 1 teaspoon pure chocolate extract, or 2 teaspoons pure vanilla extract. I love this cake. I always have it with chocolate ganache.